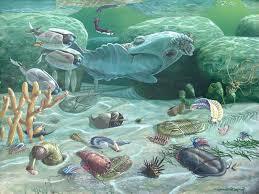 The Lord said to me “the Cambrian Mythology” and I questioned that as I know it’s not a myth that there was a Cambrian period of explosion of life. “I AM the Creator of Heaven and earth, and there are many now saying that My Word is a myth, and that Adam and Eve were not the first of creation. When the very name means earth, and red as in the blood. So taken from the earth, NOT evolved. Thus man was made from the same elements as the earth he stands on. The same minerals that make up the earth, you are made of. OT:120 'adam (aw-dawm'); from OT:119; ruddy i.e. a human being (an individual or the species, mankind, etc. ):KJV - X another, + hypocrite, + common sort, X low, man (mean, of low degree), person. We are all familiar with the name "Adam" as found in the book of Genesis, but what does it really mean? Let us begin by looking at its roots. This word/name is a child root derived from the parent דם meaning, "blood". By placing the letter א in front of the parent root, the child root אדם is formed and is related in meaning to דם (blood). By examing a few other words derived from the child root אדם we can see a common meaning in them all. The Hebrew word אדמה (adamah) is the feminine form of ___meaning "ground" (see Genesis 2:7). The word/name אדום (Edom) means "red". Each of these words have the common meaning of "red". Dam is the "red" blood, adamah is the "red" ground, edom is the color "red" and adam is the "red" man. There is one other connection between "adam" and "adamah" as seen in Genesis 2:7 which states that "the adam" was formed out of the "adamah". In the ancient Hebrew world, a person’s name was not simply an identifier but descriptive of one's character. As Adam was formed out of the ground, his name identifies his origins. “I AM GOD and there is no other. I AM THAT I AM. Yes, this is a mystery, but by faith you have been saved, and by faith you must live and have your being. Without faith, it is impossible to please God, My Word says. When you give in to theories of men, and vain philosophies of men, this is very dangerous ground upon which to walk. For the doctrines and ideas of man have nothing to do with My wisdom unless inspired by me. Life as you know it is about to change drastically. You need to be flexible enough to move when I say move, to go when I say go! This illusion of peace is only that. They are trying to create a peace which is only superficial to make a name for themselves and to fulfill their own ideas of prophecy. But I am not amused by the strivings of wicked men. Even those they espouse to “believe in” like Darwin, said that if ever they found evidence of an explosion of life in the timeline of creation of the world, then his own theory would be null and void. Yet when presented with the Cambrian explosion theory of inspired men, the wicked do not always yield, and unbelief in ME is taught in all levels of schooling. Ps 2:1-12 NKJV Why do the nations rage, And the people plot a vain thing? 2 The kings of the earth set themselves, And the rulers take counsel together, Against the Lord and against His Anointed, saying, 3 "Let us break Their bonds in pieces and cast away their cords from us." 4 He who sits in the heavens shall laugh; The Lord shall hold them in derision. 5 Then He shall speak to them in His wrath, And distress them in His deep displeasure: 6 "Yet I have set My King on My holy hill of Zion." 7 "I will declare the decree: The Lord has said to Me, 'You are My Son, Today I have begotten You. 8 Ask of Me, and I will give You the nations for Your inheritance, and the ends of the earth for Your possession. 9 You shall break them with a rod of iron; You shall dash them to pieces like a potter's vessel.'" 10 Now therefore, be wise, O kings; Be instructed, you judges of the earth. 11 Serve the Lord with fear, and rejoice with trembling. 12 Kiss the Son, lest He be angry, and you perish in the way, when His wrath is kindled but a little. Blessed are all those who put their trust in Him. There is another myth that men believe in and that is that I will not do anything about what they are doing. They think of me as the weak and powerless one, but there will be an awakening of a different sort for those who think this way. Job 8:20-22 NKJV Behold, God will not cast away the blameless, Nor will He uphold the evildoers. 21 He will yet fill your mouth with laughing, And your lips with rejoicing. 22 Those who hate you will be clothed with shame, and the dwelling place of the wicked will come to nothing." Isa 40:4-11 AMP 4 Every valley shall be lifted and filled up, and every mountain and hill shall be made low; and the crooked and uneven shall be made straight and level, and the rough places a plain. 5 And the glory (majesty and splendor) of the Lord shall be revealed, and all flesh shall see it together; for the mouth of the Lord has spoken it. [Luke 3:5,6.] 6 A voice says, Cry [prophesy]! And I said, What shall I cry? [The voice answered, Proclaim:] All flesh is as frail as grass, and all that makes it attractive [its kindness, its goodwill, its mercy from God, its glory and comeliness, however good] is transitory, like the flower of the field. 10 Behold, the Lord God will come with might, and His arm will rule for Him. Behold, His reward is with Him, and His recompense before Him. [Rev 22:7,12.] 11 He will feed His flock like a shepherd: He will gather the lambs in His arm, He will carry them in His bosom and will gently lead those that have their young. Isa 40:15-20 AMP 15 Behold, the nations are like a drop from a bucket and are counted as small dust on the scales; behold, He takes up the isles like a very little thing. 16 And all Lebanon's [forests] cannot supply sufficient fuel, nor all its wild beasts furnish victims enough to burn sacrifices [worthy of the Lord]. 17All the nations are as nothing before Him; they are regarded by Him as less than nothing and emptiness (waste, futility, and worthlessness). 18 To whom then will you liken God? Or with what likeness will you compare Him? [Acts 17:29.] 19 The graven image! A workman casts it, and a goldsmith overlays it with gold and casts silver chains for it. 20 He who is so impoverished that he has no offering or oblation or rich gift to give [to his god is constrained to make a wooden offering, an idol; so he] chooses a tree that will not rot; he seeks out a skillful craftsman to carve and set up an image that will not totter or deteriorate. 22 It is God Who sits above the circle (the horizon) of the earth, and its inhabitants are like grasshoppers; it is He Who stretches out the heavens like [gauze] curtains and spreads them out like a tent to dwell in, 23 Who brings dignitaries to nothing, Who makes the judges and rulers of the earth as chaos (emptiness, falsity, and futility). 24 Yes, these men are scarcely planted, scarcely are they sown, scarcely does their stock take root in the earth, when [the Lord] blows upon them and they wither, and the whirlwind or tempest takes them away like stubble. 25 To whom then will you liken Me, that I should be equal to him? says the Holy one. 26 Lift up your eyes on high and see! Who has created these? He Who brings out their host by number and calls them all by name; through the greatness of His might and because He is strong in power, not one is missing or lacks anything.